You guys, it was over 90 degrees here in Seattle which is absolutely crazy and amazing. 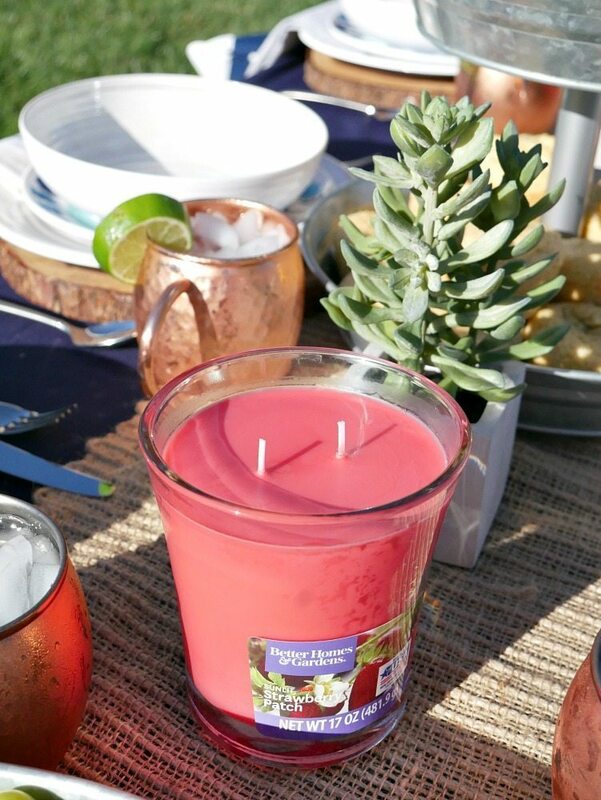 Warm summer nights in the backyard, BBQing and enjoying conversations and laughter are the best. We love having people over (and should do it more often). 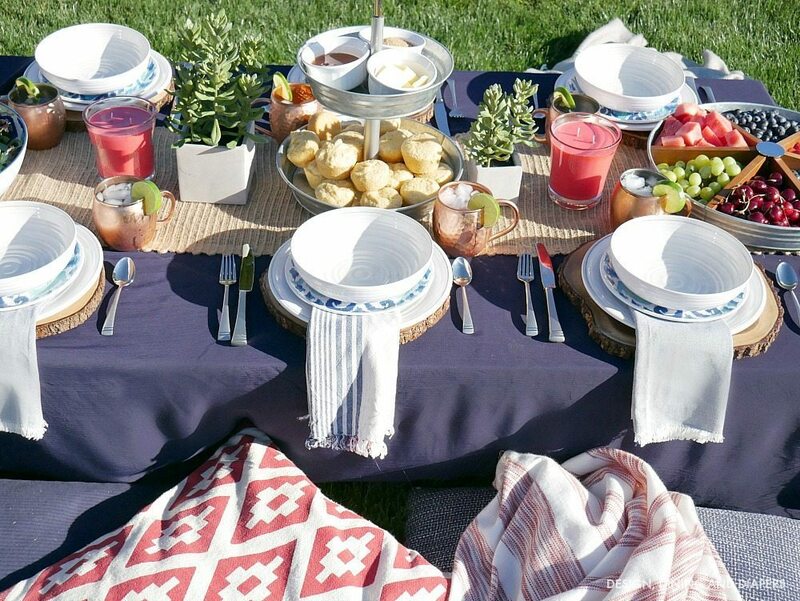 Over the years I’ve learned a few tips and tricks for making my job easier when it comes to hosting backyard events and it’s time to share my secrets with you! 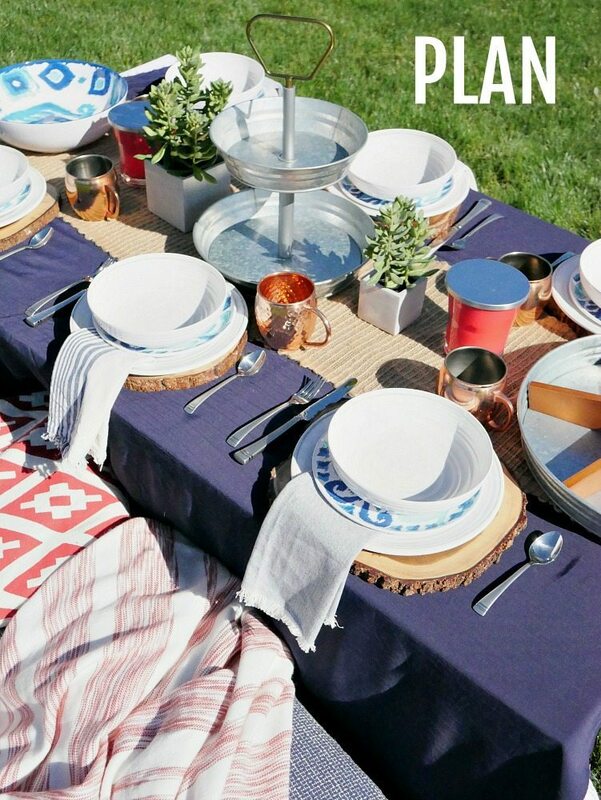 I’ve teamed up with Better Homes and Gardens Live Better and The Clorox Company to share some of my Summer Entertaining Tips and a casual yet chic backyard table setting. This look would be great for the upcoming 4th of July weekend, or any other time this summer! Can I tell you a secret? We actually don’t have a dining area in our backyard. So sometimes we have to get creative when it comes to entertaining. And that includes setting up a nice cozy space in the wide open grass! If you are in the same boat, this was a really easy to table to set up, I just flipped two buckets upside down, and created a quick tabletop out of wood and placed it on top the buckets. 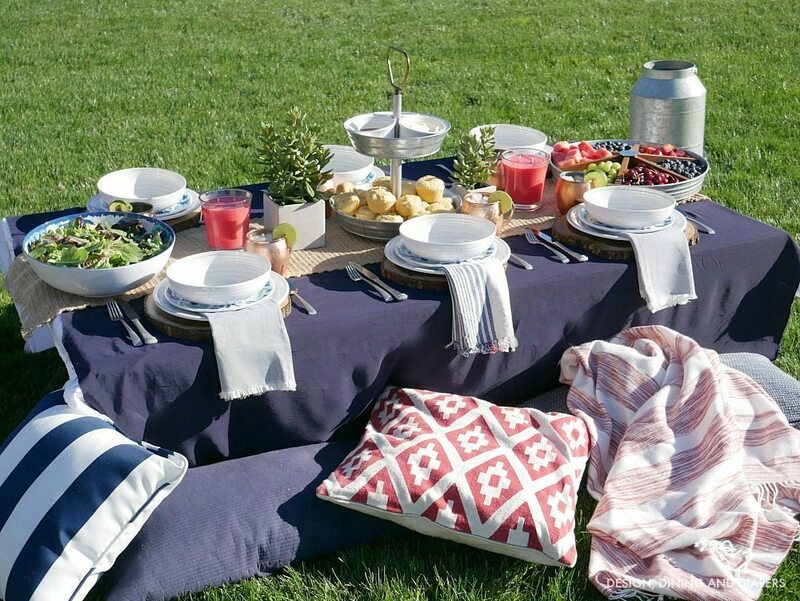 I added a tablecloth and beautiful yet budget friendly pieces from the Better Homes and Garden Line at Walmart and threw a ton of pillows and blankets on the ground for guests to get cozy with. I really love this Lazy Suzan Serving Piece , it’s perfect for fruit or condiments or just about anything! I think the ground level tables are so fun, they bring a whole new vibe to the party. It makes for a really casual and intimate gathering and guess what? Kids will absolutely LOVE sitting on the ground on a big fluffy pillow. 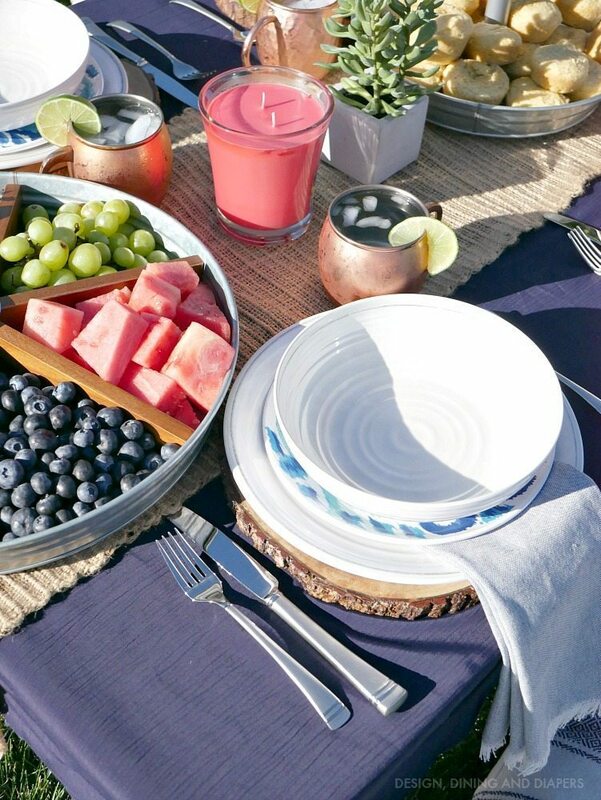 Before I dive too far into the table decor, I want to share some of my secrets and Summer Entertaining Tips. 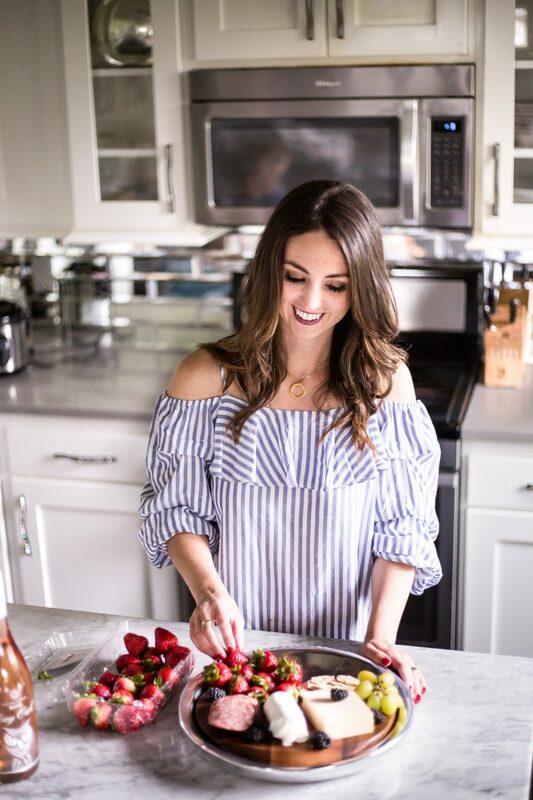 When we were first married and starting having friends over, I often found myself in the kitchen the entire time making dinner and getting everything ready. And once we had kids, it only got worse! Between preparing food, being interrupted by the kids every 5 minutes ( or 30 seconds), I hardly felt like I had time to socialize with my guests. 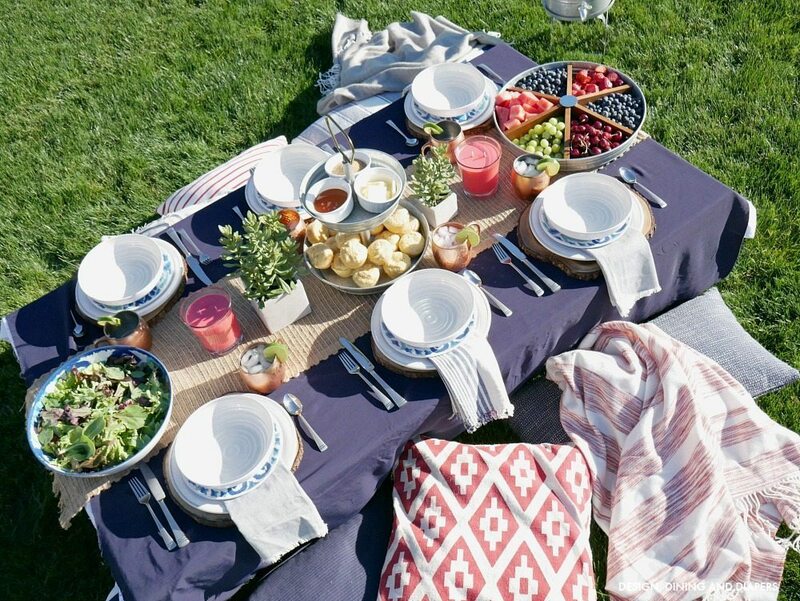 SO I want to share some of my tips with you and hopefully you enjoy your backyard BBQ a little more and spend more time socializing! Plan ahead! Set your table up the morning before (or day before). 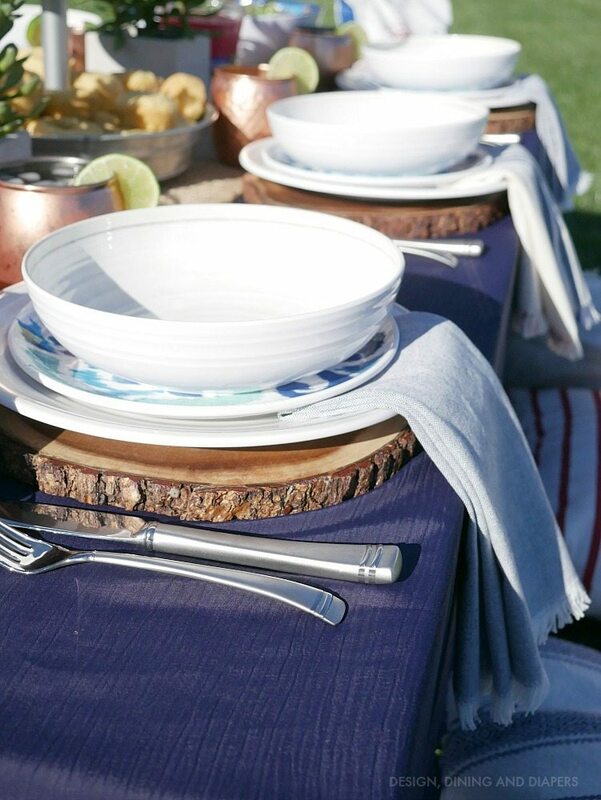 This includes linens, all the place settings and also place all the serving pieces on the table so you know where they will go and how many you will need to fit on the table! Often times, this part will end up changing my menu as I won’t have enough space for everything or we need more food! This also helps me from running around the kitchen trying to find serving pieces at the last minute, not knowing if I have what I need for the type of food I’m serving. Do all the PREP work ahead of time! Think about every little detail of your meal and do as much as you can prior to your guests arriving. 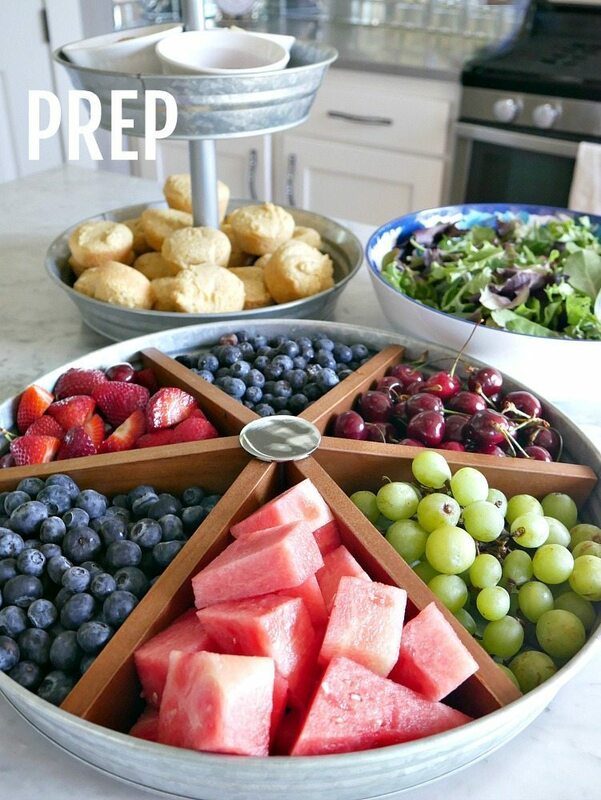 Cut up all of the fruit, wash the berries, make the muffins, and toss the salad (save the dressing for later). Then, COVER your work so it doesn’t go to waste. 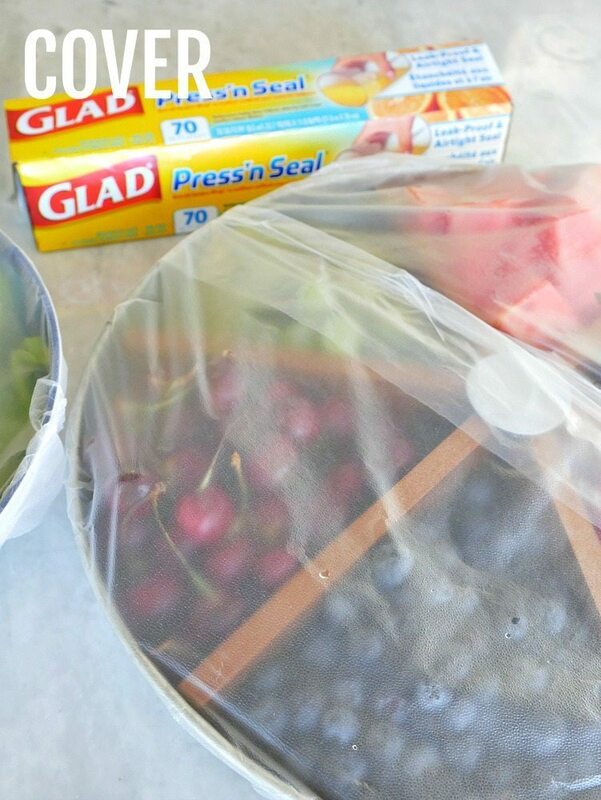 This Glad® Press’n Seal is perfect for quickly covering your food so it stays fresh. Then stick it in the fridge until right before your guests arrive. 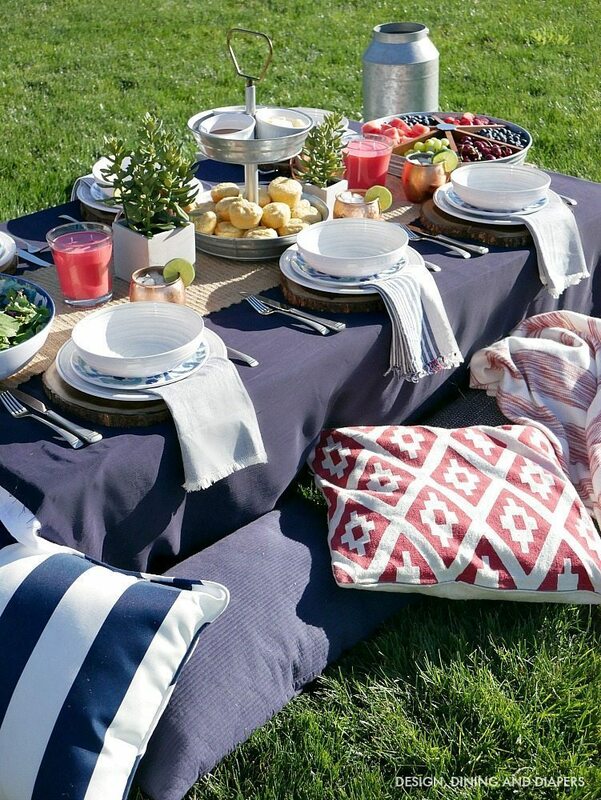 When your guests arrive, get the GRILL all ready. Then, all you have to do is toss the meat on BBQ for a few minutes. 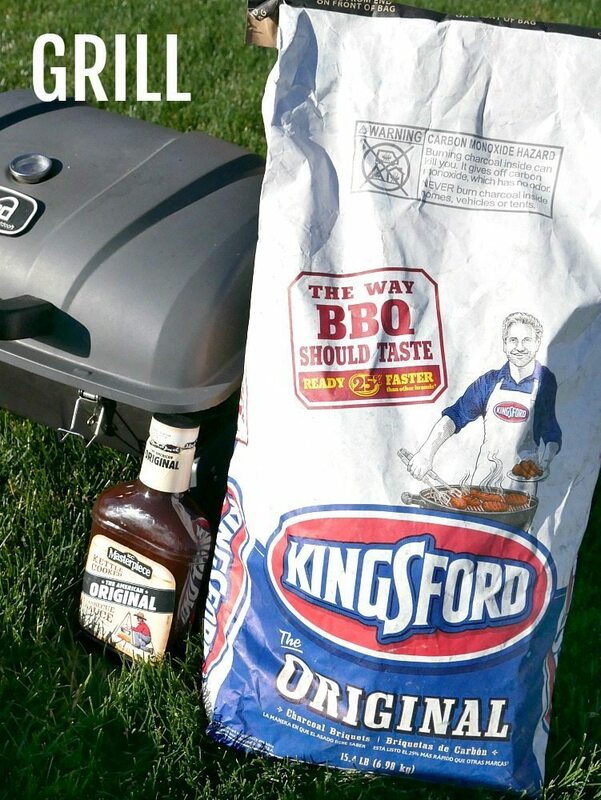 This KC Masterpiece Kettle Cooked Barbecue Sauce is so yummy! 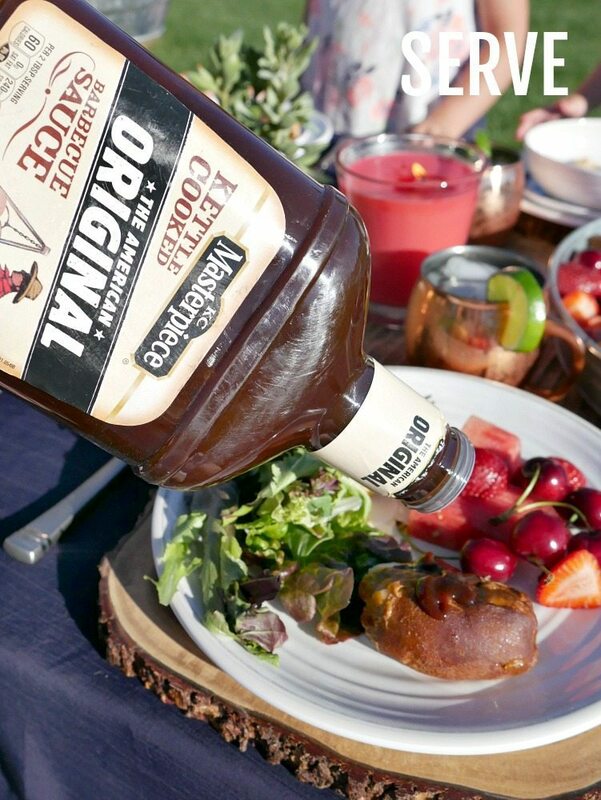 After 20 minutes on the grill, it’s time to unwrap the rest of the food, toss it on the table and SERVE your guests a delicious BBQ meal complete with a fresh coat of sauce, green salad, fresh fruit and delicious corn bread. 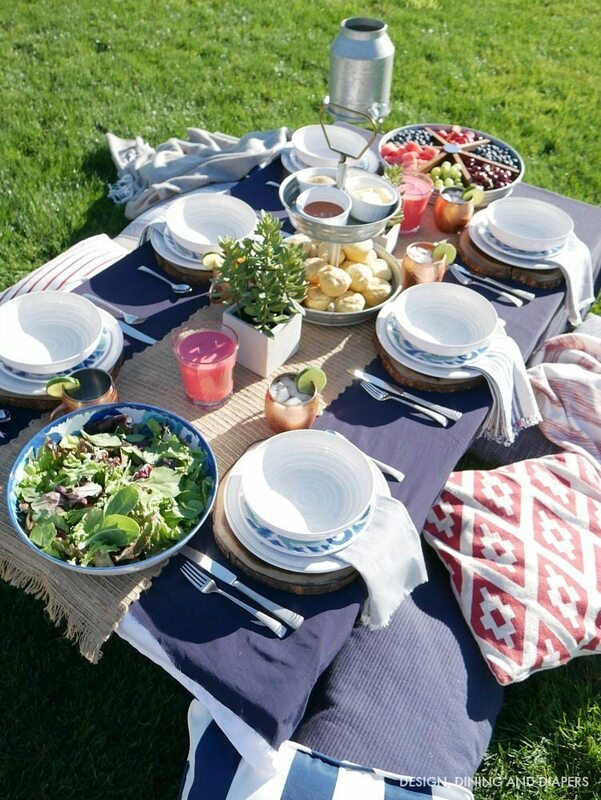 Now that you did all the prep work, you spent maybe 20 minutes at the BBQ and 5 minutes putting the food on the table you are ready to ENJOY this amazing meal and beautiful scenery with friends. If you haven’t tried this style of entertaining before, I highly recommend it. My kids absolutely LOVED eating at this table. 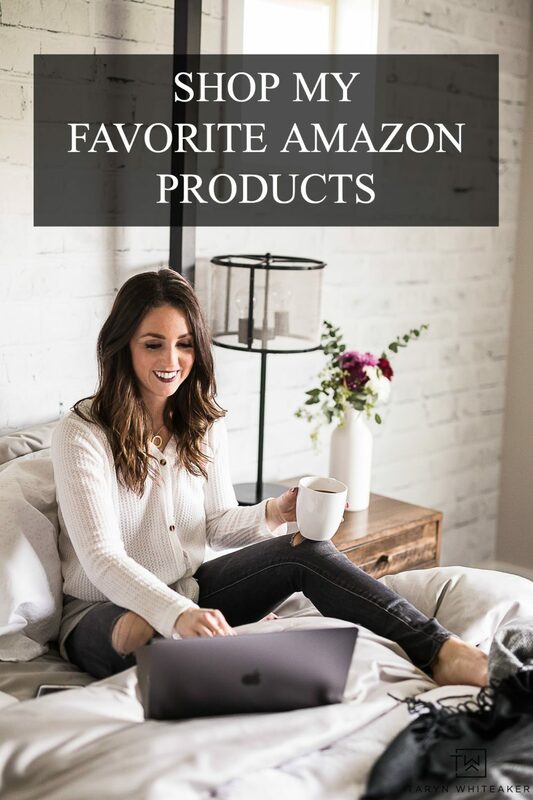 If you are looking for great Light Weight Throw Blankets for the summer time, I have these blankets in a few different colors and they are seriously my favorite. All of these plates are from the Better Homes and Gardens outdoor dining collection. They are all made in a family friendly melamine that is BPA-free and safe for use in the top rack of your dishwasher. SO awesome. 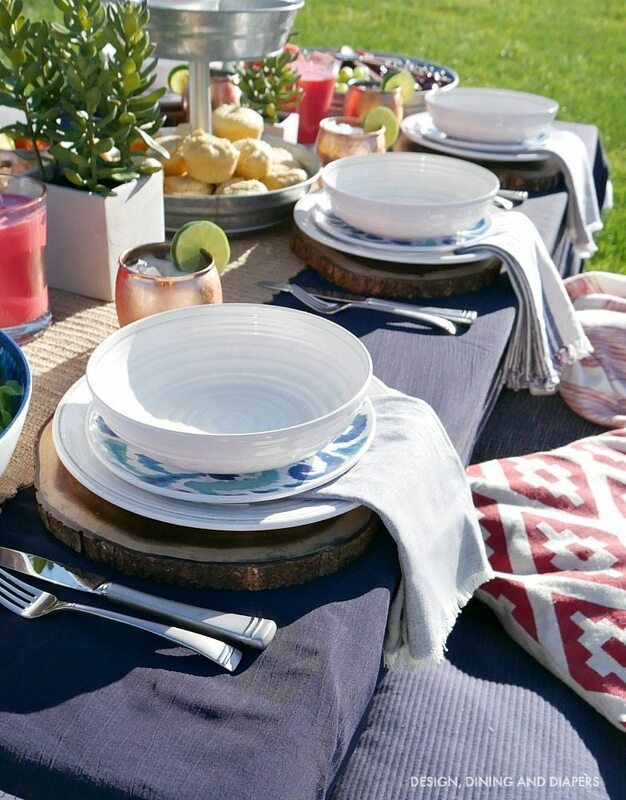 I layered the White Dinner Plates and Blue IKAT Salad Plates for a fun look. 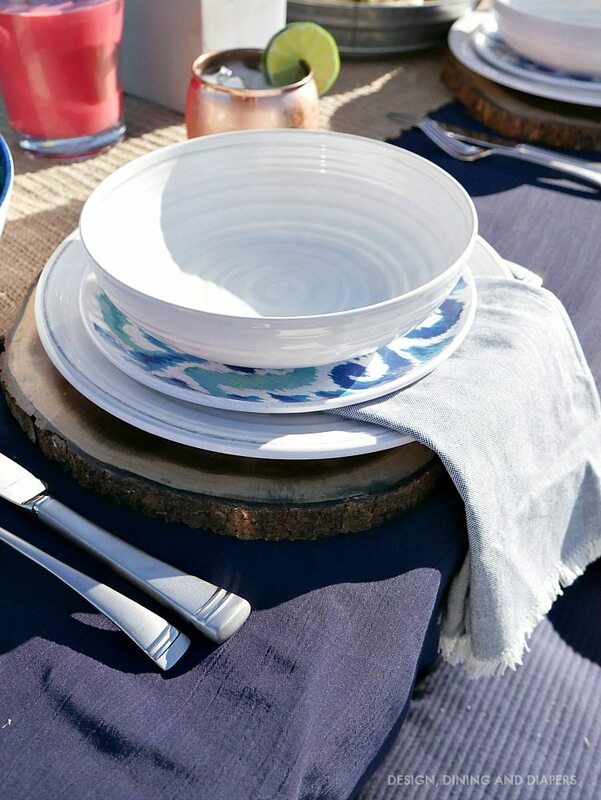 I tend to like more neutral tones and the blue salad plate was the perfect pop of color and pattern. And I can’t get enough of these Wood Chargers, they will always be one of my favorites. Corn bread is an absolute must at our BBQs. It might be one of my favorite foods. 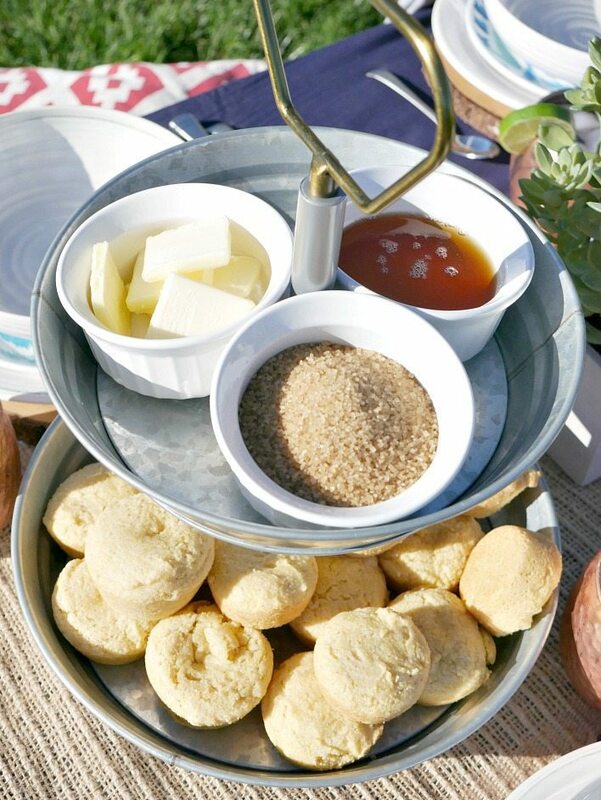 We enjoy it with butter, honey and a little brown sugar, so I created this little corn bread buffet for guests to serve themselves. This 2 Tiered Server was the perfect piece for it. Alright friends! 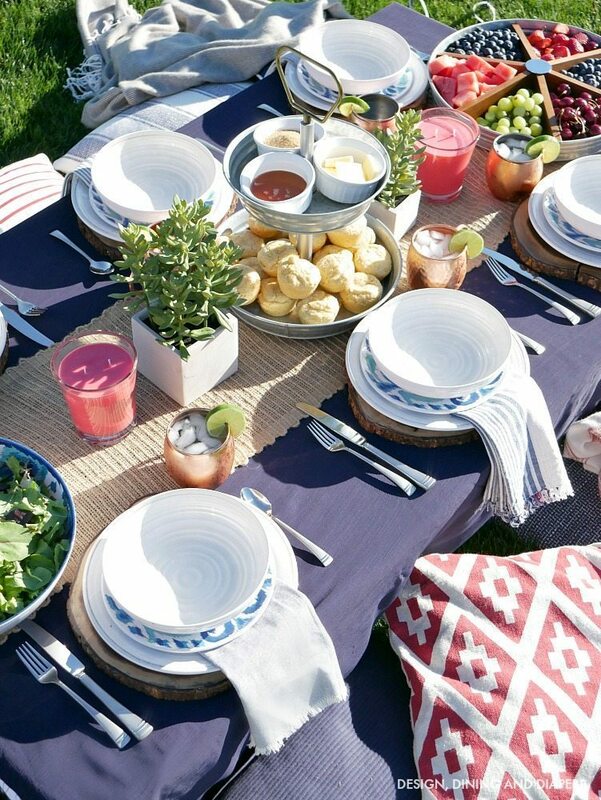 Next time you host a BBQ, I hope you can use some of these tips for planning your party and for your table! I’ve provided a great shopping list for you below. Now get out and enjoy the outdoors! Your table looks absolutely gorgeous! 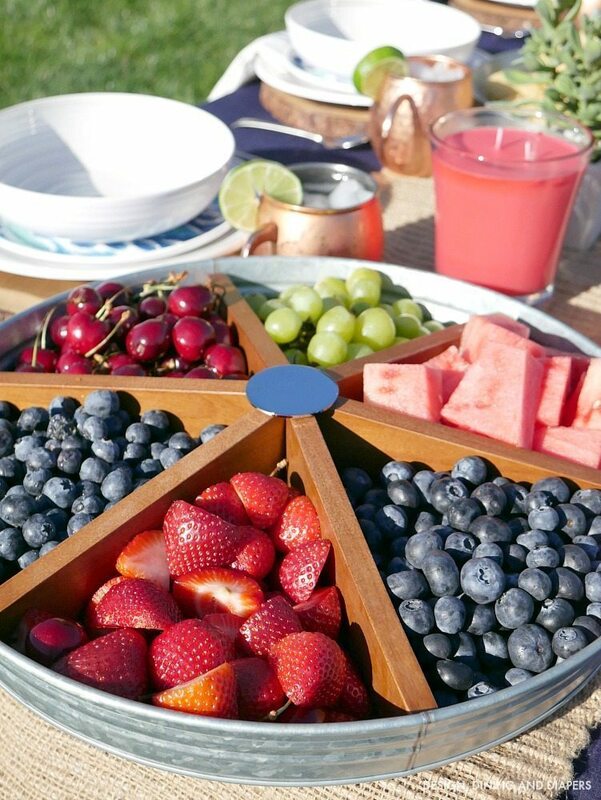 And I really love your how you served the fruit – we are having a birthday celebration this weekend so I am definitely going to use this idea – thanks for the inspiration!